It’s appropriate this “new news” is published on Halloween! One wouldn’t want to wait for the peer-review process to run its course and muddy up the water with contrarian views. 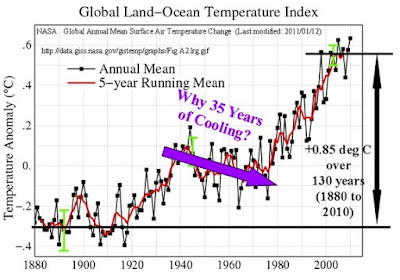 Once again the Gore-AGW-Alarmist community continues to exploit Orwell’s 1984 DoubleSpeak to “fool” the masses with the convolution of “temperature changes” with “man-made temperature changes”. You-all should think of it as one thing. After all cause-effect concepts are usually complex and we wouldn’t want to tax the intellect of the common man. And if there is some measurable increase in temperature over the past 130 years it must be man-made, what else could it be? Not until the end of this article is it divulged that the article’s authors did not even address nor allude to the CAUSE of atmospheric temperature changes. What a nice touch! This blog and most Skeptics use the 130 year NASA graphic of 0.85 degree atmospheric temperature change as a demonstration that there is NOT a catastrophic change occurring (especially when compared to the major changes that occurred during the last 3000 years of earth’s history) and that the cause is clearly NOT established but only hypnotized by various groups. Clearly the Gore-AGW-Alarmist community has lost the public confidence in their draconian proclamations of the Apocalypse of “The Day After Tomorrow”. At some point in time even the most ardent Goreites are going to understand that global temperatures and global climate are not well understood and the cause-effect systems are not consistent with the AGW hypothesis and PR story line. Alarmists: release your AGW man-caused data, analysis, assumptions and algorithms into public repositories and then come out of your closets and engage in open debate. Then and only then will you establish creditability as responsible scientists.